That the exhausted air is not sucked in at the fresh air inlet. 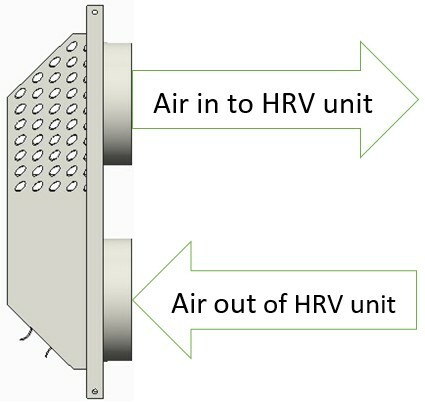 This generally means having two penetrations in the building envelope and taking two ducts (usually 150mm diameter) along the inside of the building to the HRV unit. As these duct runs will be as cold as outside, they will need to be highly insulated and indeed ideally, as highly insulated as the walls of the house. This is why it is recommended that these duct rums are kept as short as possible, as straight as possible and that cross-contamination is avoided. This can prove difficult and expensive to achieve. ProAir Systems has developed a cost effective and simple solution to this problem. It is called the ProAir FEX (Fresh Exhaust) terminal. It’s unique design allows the two air streams to penetrate the building in one opening approximately 150mm wide and 300mm high. In the top part of the unit fresh air is taken at the sides of the unit. In the lower half of the unit air is exhausted at 45 degrees away from the building at the bottom of the terminal. As the exhaust air is moving away from the building at speed, a situation never arises where this air curls back and is sucked into the inlet. Our preferred location for the air handling unit (AHU) is the utility or plant room on the ground floor. This generally facilitates the use of our FEX Terminal which can be located on an external wall beside the AHU. If the AHU has to be located in the attic it is often possible to use the FEX terminal located on an external wall. When using vents there is a requirement that air exhausted will not easily be drawn back in at the intake. For this reason intake and exhaust points must have at least 2.5 m of separation, or an angular difference of at least 90 degrees.